1 of 1 Combine mayo, basil, garlic, oil, lemon juice and 1/4 tsp each salt and pepper in a food processor. Process until smooth. Spoon into a serving bowl and stir in tomatoes. Season chicken with 1/2 tsp salt and 1/4 tsp pepper. Coat a grill pan with nonstick cooking spray; cook over medium-high 6 to 7 minutes per side, until cooked through. Drizzle pan drippings over chicken. 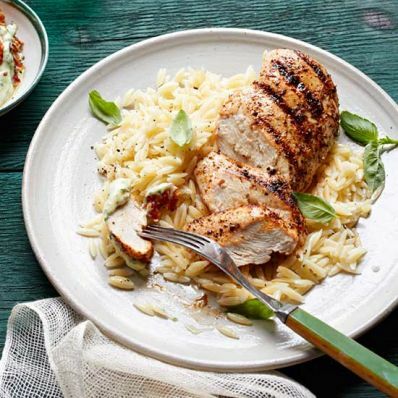 Serve with aioli and orzo. Per Serving: 30 g pro., 25 g Fat, total, 562 kcal cal., 2 g fiber, 980 mg sodium, 50 g carb.